Methicillin-resistant Staphylococcus aureus (MRSA), a virulent organism resistant to many drugs, is responsible for most nosocomial and community-acquired infections. It can cause life-threatening disease, and treatment options are limited. Effective diagnostics is a strategic key element in the campaign against the spread of MRSA, allowing better infection surveillance and control measures as well as more efficient patient treatment and/or isolation options. We collaborate on the development of a novel process flow enabling prototyping of microfluidic cartridges made out of polymer films. The wall thicknesses are smaller than 188 µm, thus enabling efficient thermocycling during real-time polymerase chain reaction (PCR). The microfluidic cartridges are designed for operation in a slightly modified commercial thermocycling instrument. 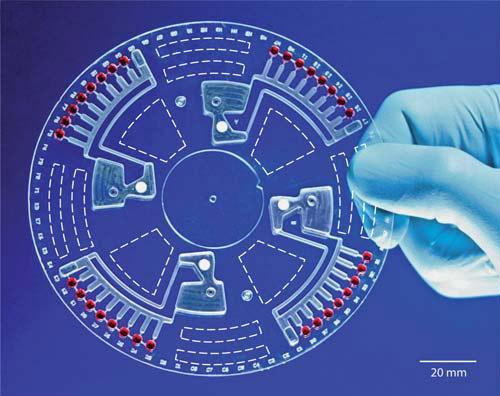 This approach demonstrates new opportunities for both microfluidic developments and well-established laboratory instruments. The microfluidic protocol is controlled by centrifugal forces and divides the liquid sample parallely into independent aliquots of 9.8 µl. The MagRSA project aims at the development of a new diagnostics platform that will provide a fast, simple, automated and accurate identification of MRSA from clinical samples. The diagnostic protocol that is proposed relies on a new and clinically validated procedure that consists of a direct one-step enrichment of MRSA present in either nasal or inguinal swabs, followed by DNA extraction of immunocaptured bacteria and their identification by multiplex sequence amplification, using real-time quantitative PCR. advanced microfluidic magnetic nanoparticles manipulation technology allowing efficient capture and extraction of target bacteria and nucleic acids. The separate steps of sample preparation, signal amplification by multiplex PCR, and simultaneous detection of multiple genes, will be performed as one single step using a ready-to-use disposable fluidic chip. In light of the above, this project aims to provide hospitals and care units with a fast, easy and automated test for the rapid diagnostic of MRSA. Moreover, the simplicity of the proposed technology concept, integrating cost effective and widely available components, allows for the provision of low cost systems, a prerequisite condition for the large adoption of molecular tests by hospitals. fully automated systems, mainly based on advanced microfluidics and nanoparticles handling technologies, for MRSA diagnostics and genotyping. The MagRSA project will address the unmet need for new diagnostics tools for management and control of antimicrobial resistance in general and MRSA in particular. Moreover, MagRSA project will provide a diagnostics platform with potential applications in molecular diagnostics as the most growing segment within the global in-vitrodiagnostics market.